Obama Says U.S. Is Prepared To Lift Sanctions Against Myanmar : The Two-Way It's going to happen "soon," President Obama said during remarks at a joint news conference with Myanmar's de facto leader, Aung San Suu Kyi. He said this comes in light of political reforms. 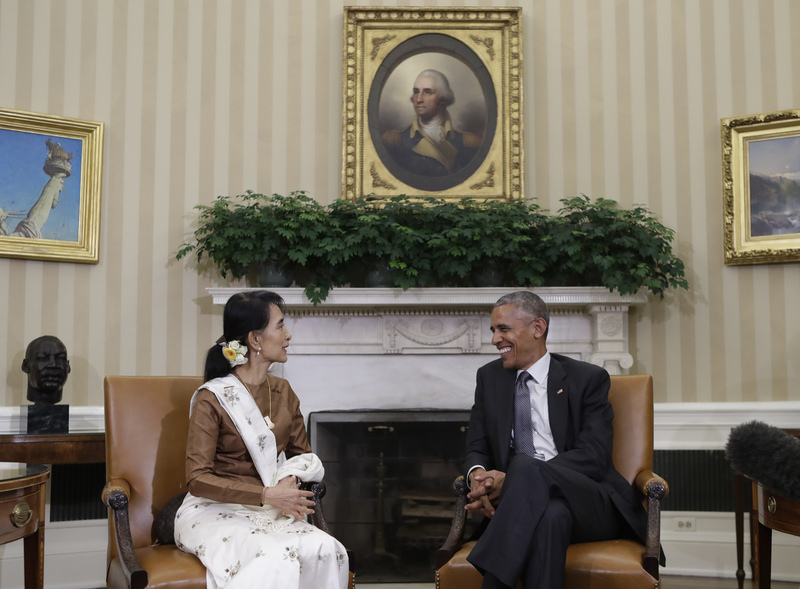 President Obama meets with Myanmar's de facto leader, Aung San Suu Kyi, in the Oval Office of the White House in Washington, D.C., on Wednesday. President Obama has announced that the U.S. is ready to lift economic sanctions against Myanmar in light of political reforms in the Southeast Asian nation. It's going to happen "soon," Obama said, but he did not indicate a specific timeline during a joint news conference Wednesday at the White House with Myanmar's de facto leader, Aung San Suu Kyi. The sanctions were imposed in 1997, and as NPR's Michele Kelemen explains, they were "originally put in place to isolate Myanmar's former military junta." The military, she says, "still controls much of the economy and retains great political power." In 2012, the Obama administration began to ease some financial and investment sanctions following political reforms, according to the Treasury Department. But it "retained more targeted restrictions on military-owned companies and dozens of officials of the former ruling junta," as The Associated Press reports. In March, the country elected its first civilian president in decades. Obama and Suu Kyi said in a joint statement Wednesday that the U.S. will also give preferential trade status to Myanmar "in light of progress on a number of fronts, including strengthening protections for internationally recognized worker rights." These changes are designed to create incentives for U.S. businesses and nonprofits to invest in the country, Obama said. The president characterized the changes in Myanmar as a "remarkable social and political transformation" after decades of authoritarian rule. Suu Kyi, the Nobel laureate who spent years under house arrest, is barred from running for president under the terms of the country's military-penned constitution. But as The Two-Way has reported, the winner of this year's election is one of her most trusted confidantes, and she considers herself to be "above the president." "When I was first elected, Daw Suu was still under house arrest. ... What we've seen over the last several years is a transition to elections, a representative legislature that still has significant constraints from the previous military government but is giving voice to the hopes and dreams of a new generation of Burmese people." The U.S. remains "concerned about the outsized role the military plays in Myanmar, as well as the country's treatment of ethnic and religious minorities," as NPR's Scott Horsley tells our Newscast unit. And Ben Rhodes, a top adviser to Obama, told Michele that the U.S. hoped to strike a delicate balance as it changed its policy on sanctions against Myanmar. "The question is, how do we balance the need to continue to demonstrate that this transition is not complete with the fact that we don't want to shut ourselves and responsible investment out of the country?" Rhodes says.